(What If? II#114 (fb) - BTS) - During the Secret Wars (@ Secret Wars#1-12), Galactus and the Beyonder killed each other and Reed Richards in the process, robbing the residents of Battleworld of their best chance of returning to Earth. Many of the villains continued to war, with other fatalities including Bulldozer, Captain Marvel, Cyclops, Dr. Octopus, Kang, Magneto, and Spider-Woman. After about five years, the groups achieved peace, with Doom building a replica of his Latverian castle and the Hulk going off to live in isolation to contemplate how they might return to Earth. The rest of the group lived in peace in a small community, many of them marrying and having children. The fate of the Enchantress is not certain, but she did mother Vincent and Balder, through Dr. Doom and the Enchantress, respectively. Balder claimed that Dr. Doom had killed her. (What If? II#114) - On Bravado's 18th birthday, a group of the teens rebelled, with Malefactor seemingly killing his father (Doom) and then gathering Chokehold, Gator, Klaw, Moleculon, and Raze and planning to take over the planet. After Bravado turned down Malefactor's offer to join them, he informed Crusader, Firefly, Mustang, and Torrent, who made plans to stop them. As the rebels took the lead in the struggle, the adults joined the conflict. The return of the Hulk, combined with the return of Doom, who had faked his own death and then came back to take Malefactor away for punishment, spelled the end of the conflict. The Hulk then revealed his discovery, combining advanced 30th century technology from the deceased Kang to help Thor's hammer navigate to from an interdimensional portal back to Earth. However, as they prepared to do so, Uatu the Watcher appeared before them, seemingly warning them that something bad would happen if they returned to Earth. The adults called off the trip, but later that night the young heroes accessed the machine, traveling to Earth for the first time and finding it overrun by Sentinels. The five of them agreed to stay on Earth as the Avengers, planning to liberate the world. 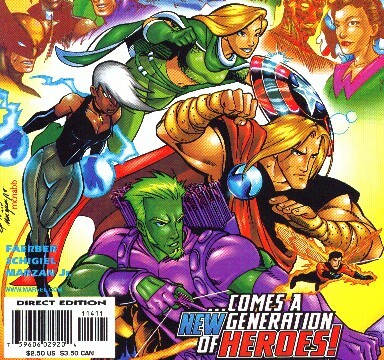 When Captain America destroyed the Forever Crystal, all of the Avengers returned from whence they'd come. Comments: Created by Jay Faerber, Gregg Schigiel, and Jose Marzan jr. This reality diverged from the events of Earth-616 @ Secret Wars#12. 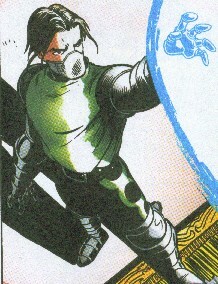 In Secret Wars, Owen Reece used his powers to transport most of the villains back to Earth. I'm not sure why he couldn't just do the same thing here. The Hulk, during Secret Wars, was on the verge of degenerating from Banner's mind to savage form, but perhaps he was able to maintain control on Battleworld...or he may have lost control, but later regained it. Lastly, the information in the What If story makes it appear as if Battleworld were in an alternate dimension. My impression was that instead on the far side of the galaxy. I thought I had gotten all of the names from What If...? II#114, but I really don't see them all, especially Raze. Were they named elsewhere? CRUSADER (el Alemain) - @ 1189 AD, Englishman, ally of King Richard, enemy of de Montfort and Saladin. CRUSADER (Arthur Charles Blackwood) - religious zealot, former seminary student, experienced a religious vision and discovered mystical armor. Firefly ( ) - parents killed by Cult of K�li, dedicated life to opposing K�li, killed Krago, died after exhausting powers attempting to destroy Shroud. FIREFLYTEs - Microverse, Tropica, Mirthria. small-winged females, attuned to binding energies of the Microverse. MALEFACTOR (Unrevealed) - Female assassin, fought Meteor Man and Spider-Man. Raze - Skrull, brother of Vranx, sought vengeance on him for murder of parents as youth, lost shapeshifting powers. skilled marksman, wore eyepatch over right eye. 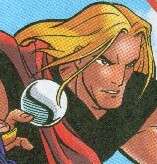 Son of Thor and the Enchantress and half-brother to Malefactor, he helped form the Avengers to oppose Malefactor's efforts to takeover Battleworld. He was summoned to the Citadel at the End of Time to assist the Avengers of Earth-616 in the Destiny War. He possesses superhuman strength and durability, as well as some magical abilities, though he has not yet proved able to lift Mjolnir. The daughter of the Absorbing Man and Titania, she flirted with Mustang, but agreed to join Malefactor in his plot to takeover Battleworld. She was taken away for imprisonment after being defeated. She has superhuman strength and durability, and she can take on the properties of materials she touches. 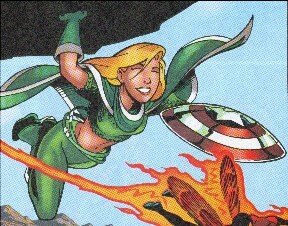 Daughter of Captain America and Rogue (aka Carol Rogers), she helped form the Avengers to oppose Malefactor's efforts to takeover Battleworld. She turned the tide of the struggle when she proved able to pick up Mjolnir and she brought it to oppose Malefactor. When Captain America prepared to chastise her for getting involved in the fight, Thor defended her by saying that she must be worthy if she had picked up Mjolnir. She was possibly summoned to the Citadel at the End of Time to assist the Avengers of Earth-616 in the Destiny War. She has superhuman strength and durability and can fly, and she uses Captain America's shield and Thor's hammer. 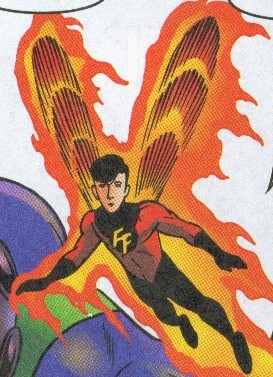 The son of the Human Torch and the Wasp, he helped form the Avengers to oppose Malefactor's efforts to takeover Battleworld. He was possibly summoned to the Citadel at the End of Time to assist the Avengers of Earth-616 in the Destiny War. He can shrink and project flame. The son of the Lizard and ? ?, he agreed to join Malefactor in his plot to takeover Battleworld. He was taken away for imprisonment after being defeated. He has a large and powerful reptilian humanoid form, but was more intelligent than the bestial Lizard. The son of Dr. Doom and the Enchantress, he plotted to kill his father and lead a group of rebel youths to takeover Battleworld. 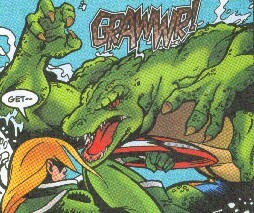 He added Klaw and a group of robots (perhaps based on Ultron) to Chokehold, Gator, Moleculon, and Raze. His group was initially somewhat successful initially, but his father then returned, revealing he had feigned destruction to learn his whole plan. He was teleported away by Dr. Doom. He was summoned to the Citadel at the End of Time to oppose the Avengers of Earth-616 in the Destiny War. He wields a combination of science and sorcery. 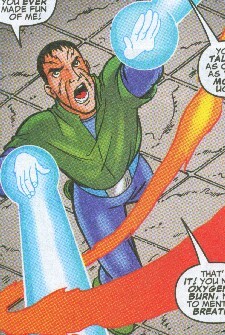 The son of the Molecule Man and Volcana, he agreed to join Malefactor in his plot to takeover Battleworld. He was taken away for imprisonment after being defeated. He has control over molecules similar to his father. The son of Hawkeye and the She-Hulk, he helped form the Avengers to oppose Malefactor's efforts to takeover Battleworld. He was summoned to the Citadel at the End of Time to assist the Avengers of Earth-616 in the Destiny War. He uses arrows and has some degree of superhuman strength (though not as much as Raze or Chokehold). The son of the Wrecker, he agreed to join Malefactor in his plot to takeover Battleworld. He was taken away for imprisonment after being defeated. He has superhuman strength and durability. The daughter of Storm and Wolverine, she helped form the Avengers to oppose Malefactor's efforts to takeover Battleworld. She was summoned to the Citadel at the End of Time to assist the Avengers of Earth-616 in the Destiny War. She can control the weather. It is unclear whether she has superhuman physical abilities.